Many of you who know me, know that my brother Bradley is a super cool guy and has been with the Houston Police Department for over 16 years. I wanted to put something together to show my appreciation for everything that Bradley does. In addition to being a cool big brother, he is also a great dad to his kids and a dedicated police officer. So I decided to put together an Epic Surprise. With all of the negativity surrounding law enforcement, I thought it would be really sweet to pull off an epic surprise party for my brother and build him something special. I got the idea for this project in November of 2015 when I was taking my son to the range. I was thinking about some of the cool things that my brother has done for me in the past and I came up with the idea that I would build him a basic patrol rifle. As the idea developed over time, it grew into something larger than I had originally imagined. I started acquiring parts for the build starting in January 2016 and with each passing month, bought another piece that was needed in order to complete the build. The first piece that I acquired was the Spikes Tactical Crusader lower. My friend Ben “Mookie” Thomas and the other guys at Spikes Tactical make some of the best AR-15 receivers available today. Of course along the way, I had plenty of time to think about how I would pull off this epic surprise for Bradley, so I finally decided on shooting a video. Then, I got the idea that maybe I could find people to help me out. When I asked Capt. Clay Higgins, he was quick to respond with a big “Yes! I would love to!” Capt. Higgins is just a salt of the earth all around good guy and both Bradley & I respect him, so it was really huge when he said that he would help. A good friend introduced me to someone who was able to obtain some video from R. Lee Ermey commenting on Bradley’s epic surprise and that was pretty awesome! “The Gunny” is every Marine’s hero, so to have him involved was a true blessing. Then, another friend was able to get a shout out from Michael Biehn, which was super cool too! As this all came to a head, the rifle had become more than just a simple patrol rifle. I couldn’t just go with standard parts, I wanted to get the best barrel, a better Bolt Carrier Group, some bones for the rifle and then of course, I ended up getting optics. Along this journey, I met Gerald Courville of Laser Edge Engraving and I have to tell you, his engraving is amazing. That man can engrave just about anything. On top of that, Gerald is just a really nice guy who was great to work with. I will be taking more guns back to his shop in the future… Maybe even a Yeti cup. None of this would have been possible without help from many folks, mainly LaRue Tactical and Palmetto State Armory. Both LaRue and Palmetto State Armory were just as excited about his build as I was. In my opinion, LaRue Tactical makes the best mounts in the World. You know how the old saying goes, “Buy Once, Buy LaRue.” When LaRue Tactical heard what I was up to, they readily jumped in and wanted to be involved. It is clear to me that the folks at LaRue Tactical stand behind Law Enforcement and are great Ambassadors of the State of Texas. And when it comes to parts, Palmetto State Armory is going to have what you need. I signed up for their Deals blast and that helped a lot during this slow build. When something went on sale, I snatched it up. I want to extend a hearty thank you to LaRue Tactical, Spikes Tactical, Palmetto State Armory, Capt. Clay Higgins, R. Lee Ermey, Julie Golob, Michelle Vicusi McAllister, Michael Biehn, Gerald Courville at Laser Edge Engraving, Chris Eichenlaub, Gen. Joe Ramirez, Tim Stanley and many others. Captain Clay Higgins agreed to shoot a reveal video and got his media manager involved. Together, they created a professional production that sadly, I never got to see. About the time they had it put together, Louisiana saw flooding of biblical proportions and Capt. Higgins’ media manager lost his home in the flooding. When Captain Higgins found out that the video had been lost in the flood, I only had one day left before the reveal at the surprise party. Capt. Higgins literally pulled off of the highway and shot a video with his phone in his vehicle. Honestly, I think his video is perfect, but it goes a step beyond. Despite the fact that everyone around him was hurting (including his own daughter) and dealing with the loss of their homes; trying to survive given the limited resources that were left behind in the wake of the flood, Captain Higgins still somehow made time to take a quick video and send it. That meant so much to me, but more importantly, says a lot about the man. Once again, Captain Clay Higgins demonstrates that he is a man who stands by his word, no matter what obstacles he may be facing. Thank you Captain Higgins for your perseverance among the storm, you are truly an amazing man! Due to the fact that I was planning on using a video to introduce this epic surprise for Bradley, I needed to find a location where we could get together and have a large screen. After calling around to a few area restaurants, I spoke with Adam Harling at Spring Creek Barbeque in Shenandoah, TX. Adam told me that he would reserve their party room and make sure that the A/V equipment would be in good working order for our gathering. Had it not been for Adam and his team making some last minute adjustments for us, this whole thing would have been less than epic. Thanks Adam for coming through for us!! I invited some of Bradley’s friends out to join in the surprise. Wayne Thompson, Neil Craig and Lawrence Baitland. Bradley has been friends with Wayne since they were in middle school together. Neil and Lawrence both were in the Corps of Cadets at Texas A&M with Bradley and were members of the Fightin’ Texas Aggie Band – B-Batt C/O ’96. Recently, I visited Germany and I had many great experiences. Of course, my favorite story from the trip happened on my way to get this picture of Heidelberg. I was travelling with a group of high school students who were on an exchange program to Germany, my son included. When we stopped in Heidelberg to spend the day walking around and exploring, I knew that I wanted to get a shot of the city from the hill across the river. Of course, when I asked if anyone wanted to go with me, no one else was up for the adventure. So, I decided to go alone. Starting in about the middle of what is pictured above, I walked across the bridge and then crossed the street to begin the ascent up the hill. Now, I am from Houston, Texas which is flat… And I mean flat. I am neither used to walking up hills nor am I built for the task, but I am not about to walk away from the opportunity to shoot Heidelberg from up on the hill. As I began to climb up the endless stairs and ramps that lead to the top, I started to think that maybe I had just turned in my vacation card, because this was serious work. By halfway, I was pulling on the handrails and I had broken quite a sweat. I stopped momentarily to see the city behind me and the higher I got, the better the view got, so I kept climbing. About three quarters of the way to the top of the hill, my legs were burning, my chest felt like it was going to explode and I couldn’t seem to catch my breath. This hill was quite larger than I had originally understood. I took my pulse and it was above 200 bpm, so I figured that I should stop for a rest unless I wanted to go into heart failure. So, I decided to put one foot in front of the other and get moving. I thought maybe I could repair my ego by catching up to this woman and at least not allowing her to beat me to the top. Well, I never did catch up to her… To be honest, I never even caught sight of her until I arrived at a Biergarten at the top of the hill. There was the woman, sitting down at a table enjoying the sunshine and she had almost finished her beer. The only solace that I have is that she has probably been walking up that hill for the past 60 years. I am still laughing about my experience in Heidelberg. This day one of my trip to Germany and today we went to Braunfels Castle in Wetzlar, Germany. Braunfels Castle is around 800 years old and it is filled with historical artifacts documenting its history. As we walked into the Knight’s Hall, we were greeted with armor that is more than 500 years old and a sword that dates back to 1300 A.D.
Moving through the castle, you are treated to furnishings from the Baroque and Victorian ages as well as other items that were gifted to the noble family from as far away as China. The walls of Braunfels Castle are adorned with tapestries dating back 700 years. Braunfels Castle is still occupied by the noble family members, so some parts of the castle are off limits as it is a private residence. For more information about visiting Braunfels Castle, please go to http://schloss-braunfels.de The brochure states, “Weaponry of tournament, war and hunting from 13th to the 19th century…” They did not disappoint. Our tour guide, Marcus, was great and had a real well developed depth of knowledge about the history of the castle. Germany has greeted me with beautiful fields of green and dense forests. The entire countryside is absolutely breathtaking. I am looking forward to seeing what else I find on this trip. Stay tuned! I would like to thank the Houston Museum of Natural Science for having me out to the #PixelParty at the Cockrell Butterfly Center this morning. The Pixel Party is an invitation only event where photographers are invited to take pictures in an exhibit of the museum. This morning, the Pixel Party was in the Cockrell Butterfly Center at the Houston Museum of Natural Science. I was amazed at the variety of butterflies that are in the exhibit. Imagine that you step into the middle of a rainforest with a 40 foot waterfall, surrounded by ferns and other vegetation. Then, add a bunch of friendly butterflies that are casually floating around you as you walk among the paths. It is definitely one of the most peaceful museum exhibits that I have visited. For two hours, I watched as butterflies played with all of the photographers as we tried to snap pictures of them. Some of the butterflies decided that they would strike poses for the camera, while others flew around our heads trying to figure out what we were doing in their exhibit so early in the morning. The Pixel Party is always held outside of normal business hours of the museum in order to allow photographers the room to take cool shots that would not otherwise be possible during the business day at the museum. While there were a lot of photographers, I would have to estimate the number of butterflies at the exhibit had to outnumber us by a ten to one ratio. Erin from Erins’ Creative Energy had three butterflies that apparently loved her so much, they kept landing on her camera and arms. Some of us ended up taking pictures of Erin as she hung out with her new friends. The Pixel Party is also a good opportunity to meet other photographers from the area and I always enjoy learning from others. There were some photogs at the Pixel Party that had some serious Macro setups that were quite impressive. Of course, being that my usual forte is landscape photography, I don’t even have a macro lens. Maybe one day I will get into Macro photography, but until then I can appreciate other people’s passion for it. If you are looking for a great place to see butterflies freely circling around you, then I would highly recommend a visit to the Cockrell Butterfly Center. This was my first time in the exhibit, but it won’t be my last. 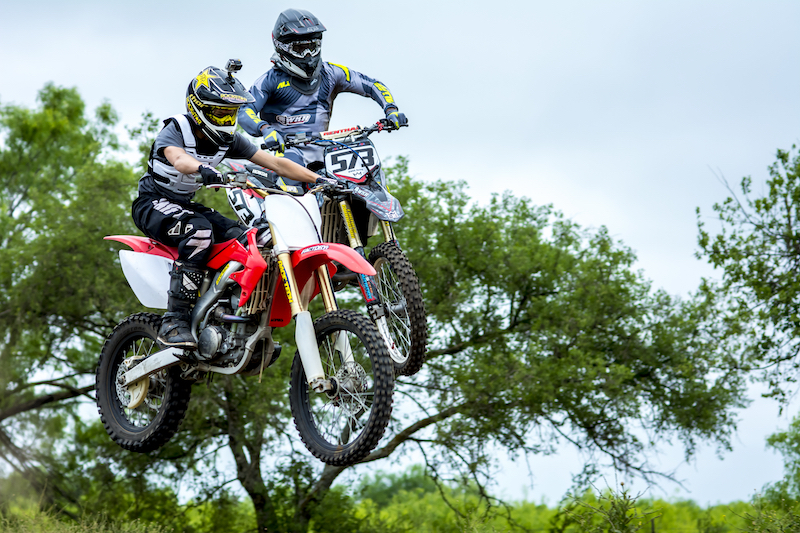 I would like to say a special thanks to Chris Shaw at the White Knuckle Ranch in Hondo, TX for allowing me on the track during one of of their race events a few weeks ago. My friend, Ryan Alexander (#573), invited us to come out and watch him race. Of course, when I showed up with camera in hand, I was expecting to have to take shots in the 200-300mm range, but after a brief discussion with Chris, I pulled out the 35mm prime and hit the track. Needless to say, it was exciting to shoot a race that close to the action. It seemed that bikes were flying right in front of me… Oh wait, they were! Ryan is part of the WKR Racing Team and it was a lot of fun to watch him fly through the air and do things on a bike that I would not even entertain trying myself. Big guys like me may fly the same, but it is the landing that tends to be a little different. The White Knuckle Ranch has a very well developed track with some great jumps. I basically set up at the base of one of the hills that everyone would catch air and took shots from that vantage point for much of the races that I shot. At one point, I had to put down my camera and just enjoy watching the action. There are some very competitive racers that attend their tournaments and it was exciting to see them battle it out on the track.